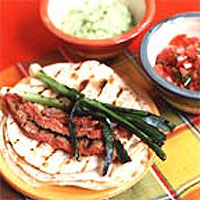 You can use wheat tortillas for this recipe. Authentic Mexican corn tortillas are not readily available in the UK. If you want to make your own, you'll need maize flour (masa harina) and a tortilla press. The Cool Chile Company sells these by mail order (call 0870 902 1145 or visit coolchile.co.uk). Jalapeño chillies are the fat green ones you'll find in the fruit and veg section, normally just labelled 'green chillies'. For the guacamole, halve, stone and peel the avocado. Put in a food processor with all the other guacamole ingredients and blend until smooth. Transfer to a small bowl for serving. For the salsa cruda, put the tomatoes, chillies, onion and coriander into the (cleaned) food processor and pulse to blend into a coarsely chopped sauce. Transfer to a small serving bowl. Warm the tortillas according to the packet instructions. Keep warm. Lightly sprinkle each slice of beef with ¼ tsp salt (sprinkle both sides) and set aside for 10 minutes. Meanwhile, heat a griddle pan over a high heat until smoking hot. Brush the griddle very lightly with oil and cook the onions for 4-5 minutes, turning once or twice, until tender. Remove to a large warm serving plate and keep warm. Brush the griddle lightly with oil once more, add one of the beef slices and cook for 20 seconds on each side. Lift onto the serving plate. Repeat with another three slices. Garnish the plate of beef and onions with the lime wedges and take to the table with the warm tortillas, guacamole and salsa cruda and get people eating while you cook the rest of the beef. Instruct your guests to cut the steak and onions into pieces and use to fill their tortillas, flavouring them with the two sauces as they wish.